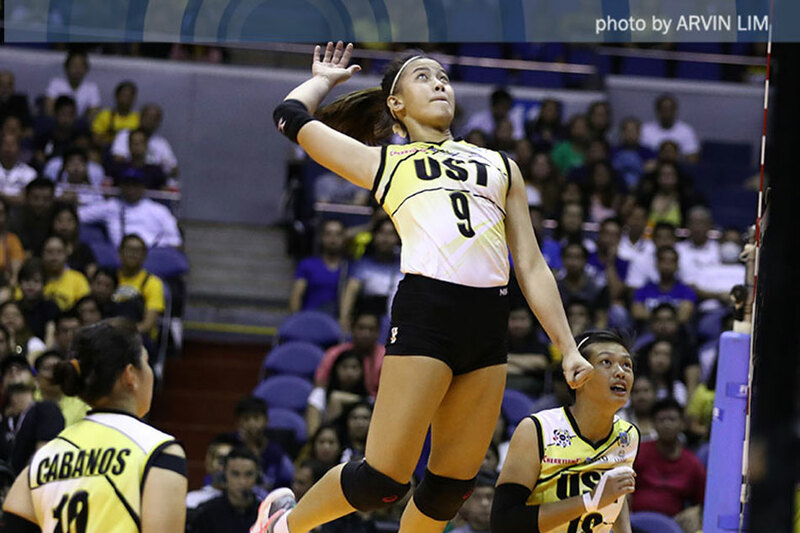 UST's EJ Laure rises for a spike against National University. Arvin Lim, ABS-CBN Sports. MANILA, Philippines — It was a sight fans of the University of Santo Tomas never wanted to see — star spiker EJ Laure down on the mat, in tears, and clutching her right ankle just as the Tigresses were on the brink of victory against National University. Laure had landed on the ball after her spike was blocked by NU's Jaja Santiago, and that allowed the Lady Bulldogs to trim their deficit to one point, 12-13, after the Tigresses had already led by as many as four, 12-8, in the do-or-die fifth set of their crucial UAAP Season 79 match. The UST gallery thus breathed a sigh of relief when Laure gingerly stood up, stomped her right foot a few times to shake off the pain, and stayed on the court. The Tigresses made sure that Laure's effort would not go for naught: skipper Sisi Rondina put UST at match point, and Dimdim Pacres scored the match-winner. Laure still finished with 22 points in UST's epic 20-25, 19-25, 25-22, 25-21, 15-12 win that allowed the Tigresses to clinch the No. 3 seed in the Final 4. Afterward, however, she could only express her gratitude to her teammates who stepped up when she was down. In particular, she was thankful for Rondina, who made it a point to ask for the ball in the next rally in an effort to make up for Laure's miscue. "Nakakagaan pa lalo, kasi s'yempre, batchmate ko pa 'yun," Laure said of Rondina. "Alam niya 'yung capabilities ko, na hindi ako gi-give up. Gagawin ko lahat talaga para sa team." According to Laure, she shed tears during the fifth set not due to the pain, but due to the untimely nature of her injury. "Feeling ko, kaya ako umiiyak kasi, hindi dahil doon sa sprain, dahil doon sa malapit na eh," she said. "Two points na lang. Tungkol sa laro talaga 'yung tears." "Naisip ko lang, matatapos na 'yung game, doon pa ako na-sprain. Ang gusto ko lang kasi, matapos 'yung game na andoon ako," she added. Rondina, who also scored 22 points in the victory, said she really wanted to lift up Laure, who had kept the Tigresses in the match with several hits in the third and fourth frames. "Gets ko na si EJ eh," said Rondina. "Kapag mga ganoon talagang sitwasyon, hindi talaga siya aayaw. Inisip ko na noon, at sinabi ko na kay Ate Alex (Cabanos) na, 'Ate Alex, sige ibigay mo na lang sa akin, ako na ang babawi para sa kanya.' "
UST coach Kungfu Reyes, meanwhile, hailed Laure's toughness. "Tumayo siya. Good indication. 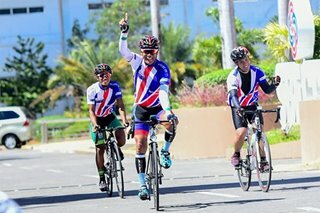 Talagang nakikipagdigmaan na sila ng totoo," he said. Laure says she still feels pain in her right ankle, but the UST star was able to walk comfortably following the match. She will also have plenty of time to rest as the tournament takes a break for the Holy Week before resuming for the Final 4.